Once again CSAS is offering Snow School for Water Professionals this year from February 28 – March 2, 21018. This combination classroom and field course will begin on Wednesday morning at our office in Silverton and end on Friday afternoon. This class is perfect for anyone wanting to learn more about the role of snow and our mountain systems as it pertains to water resources. 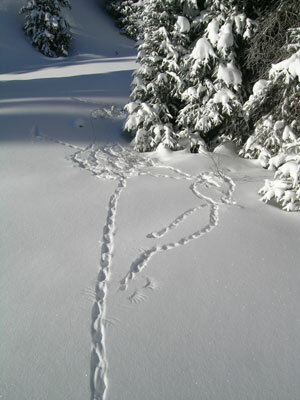 Please do not hesitate to contact Jeff Derry at jderry@snowstudies.org with questions. Denver International Airport Exhibit: We just installed 4 display cases at DIA focused on CSAS, dust-on-snow, and the science we support at Senator Beck. This three month long display is part of the Colorado Snow & Ice Exhibit and can be seen in the walkway towards Terminal A before you get to security. If you walk from the Main Terminal toward Terminal A, you will soon see the display cases, so even if you intend to go through the main security gate, and have time, the display is still easy to view. As part of the DIA effort, Christi Bode with Moxicran Media, made a 2-minute promotional video. This video is also located at the top of this homepage. Upgraded Website: You may have noticed our new and improved website. Initially, you will see pretty much the same content but with a new flare, but we have a number of improvements and new tools in the works that I will share with you as they become available. Nov 18: Register now for our 2017 Snow School for Water Managers which will be held March 1st-3rd, 2017. Space is limited. Sign up today! Oct 31: The Swamp Angel and Senator Beck study plots have been selected as reference sites for the Earth System Model-Snow Model Intercomparison Project (ESM-SnowMIP,). These sites are of great value to ESM-SnowMIP because of the availability of high-quality meteorological and hydrological measurements at different elevations and over multiple years. ESM-SnowMIP will assess the strengths and weaknesses of snow models as a contribution to the World Climate Research Programme’s Grand Challenge on “Melting Ice & Global Consequences”. The ability of models to predict melt rates for snow with dust loading in the Senator Beck Basin Study Area will be of particular interest. Oct 22: Executive Director, Jeff Derry, presented at American Association of Geographers in Colorado Springs and discussed the new SnowEx campaign at SBSB as well as our unique dust-on-snow monitoring program. Feb 10-12: This year’s CSAS Snow School for Water Professionals enjoyed hands-on snow observing experience in the field, following morning indoor sessions focusing on snow climatology, snowpack formation, snowmelt energy budgets, and snow data sources and interpretation issues. Jan 27-29: Jeff Derry attended the Colorado Water Congress Annual Convention in Denver, attracting over 500 stakeholders in Colorado water policy and management, including many of our CODOS program supporters and users. October 5: CSAS’s Summer 2015 data is now available, as Excel workbooks, on our Archived Data webpage. The datasets span June 21, 2015 through September 30, 2015. Our comprehensive workbook contains several worksheets for various time intervals, including 1-hour, 3-hour, and 24-hour summary data. Also presented are updated Metadata for Swamp Angel, Senator Beck, and Putney Study Plots. The complete, integrative Senator Beck Basin dataset revealed compelling details and insight on the highly unusual “Water Year” (October 2014 through 2015) throughout Colorado. September 1: The Arizona Republic recently ran an extended series of articles describing stresses on the Colorado River system and its water users, with a focus on Colorado snow. CSAS’s Chris Landry spent a day with the reporting team in April and the article features visits to several of our Colorado Dust-on-Snow program field sites, along with quotes from Landry and extracts from the CODOS Water Year 2015 Season Summary. View the complete Arizona Republic article by clicking here. June 25: CSAS Executive Director Chris Landry presented a review of “what has the science taught us …” about dust-on-snow at the 40th annual Colorado Water Workshop in Gunnison on June 24. The workshop has a long and storied history of presenting new science and “all responsible positions” on water issues, and this panel discussion included a review of climate change science as well. Neither dust-on-snow nor climate change were on the agenda at the first Water Workshop, 40 years ago. Landry’s first presentation about dust-on-snow at the Water Workshop was in summer 2006. June 24: CSAS’s Winter 2014/2015 Senator Beck Basin data have been QC’d and are now posted, as Excel workbooks, on our Archived Data webpage. Winter 2014/2015 data began October 1, 2014 and run through June 20, 2015. Each Excel workbook – for the Swamp Angel, Senator Beck, and Putney Study Plots – contains several worksheets for various time intervals, including 1-hour, 3-hour, and 24-hour summary data. Also presented are updated Metadata for each study plot, a “Sensor Status” workbook showing instrument height above the snow surface and other data, a compilation of all of the Winter 2014/2015 snow profiles performed in Senator Beck Basin, and a snow profile metadata document describing our methods. This was a highly unusual winter throughout Colorado and the complete, integrative Senator Beck Basin dataset captured the details, perhaps as well as any location in Colorado. April 2: CODOS was featured in the High Country News recent blog post “Colorado’s snow is dust-free for the first time in a decade” on Colorado’s dust-on-snow “dust free” March. To view the article, visit High Country News website. As it happened, CSAS and our Colorado Dust-on-Snow monitoring program logged it’s first dust-on-snow event at Senator Beck Basin just a couple days into April, and other locales also reported dust from that storm. See our CODOS Program website at www.codos.org. April 2: A snow hydrology research team led by Karl Lapo, at the University of Washington, have recently presented a new peer reviewed paper in the prestigious journal Water Resources Research titled “Impact of errors in the downwelling irradiances on simulations of snow water equivalent, snow surface temperature, and the snow energy balance”. They utilized radiation measurements and other data from the Senator Beck Basin Swamp Angel Study Plot for this analysis. The abstract for the paper is available here. Feb 11-13: This year’s CSAS Snow School for Water Professionals benefited from warm, dry, and sunny days here in the San Juan Mountains. Participants Rob Phillips from the Rio Grande Water Conservation District, Nathan Elder from Denver Water, Brenna Mefford from the Wyoming State Engineer’s office, and Marta Nelson from Radiometrics Corporation in Boulder came to the session with four quite different job duties and perspectives. From left to right, Nathan (back to camera), Rob, Brenna, and Marta got hands-on snow observing experience in the field each day, following morning indoor sessions focusing on snow climatology, snowpack formation, snowmelt energy budgets, and snow data sources and interpretation issues. Jan 29-30: Chris Landry attended the Colorado Water Congress Annual Convention in Denver, attended by some 500 stakeholders in Colorado water policy and management. Highlights included panel discussions regarding climate change impacts on Colorado water supplies (where the impacts of dust-on-snow were also mentioned) and ‘worst case’ drought planning activities among the Upper Colorado River Basin states. All of our CODOS program supporters and users were present at the meeting, and our former director Eric Kuhn participated, as always, in several of the panels and plenary sessions. Dec 23: We’re very pleased that Senator Beck Basin data are supporting an expanding group of mountain researchers. Our downwelling longwave radiation and other data were analyzed by Yonghua Chen (Columbia University) and her colleagues in a recent peer-reviewed journal article in Environmental Research Letters. Mark Raleigh and his colleagues also utilized our data, along with data from comparable study areas, to test snow model sensitivities to errors in “forcing data”. Still other papers now in review also utilize Senator Beck Basin data … stay tuned. Also, several presentations at the just-concluded American Geophysical Union Fall Meeting utilized Senator Beck Basin data including two about snowcover modeling, by Mark Raleigh (National Center for Atmospheric Research) and Michael Follum (Army Corps of Engineers). September 29 – October 3: CSAS attended the International Snow Science Workshop in Banff, Alberta, and Chris Landry presented a poster and paper on “Desert Dust and Snow Stability”. Japanese ISSW participants and others found the CSAS “Desert Dust and Snow Stability” of interest, vis-à-vis there own experiences with dust-on-snow. August 19: CSAS conducted a field tour to the Swamp Angel Study Plot and Senator Beck Stream Gauge for a class of 24 Colorado State University undergraduate and graduate students during their Watershed Practicum in the San Juan Mountains. Their faculty advisor Dr. Steven Fassnacht is at the far left, pointing toward the tower. Chris Landry gave the class a talk on dust-on-snow later that day. July 19-27: Third survey of Senator Beck Basin vascular plant community completed: in a marathon effort from July 19-27, botanists Peggy Lyon, Sara Simonson, and Renee Rondeau (left to right in the July 20, 2014 photo to the right) completed our third comprehensive inventory of the Senator Beck Basin plant community. Gordon Rodda also assisted. Species and coverage were documented in a total of 230 plots of 0.1 m2 along 23 established transects at three different elevation bands, in the sub-alpine, at treeline, and across alpine tundra. This dataset complements the original July 2004 baseline data and the July 2009 first repeat study. Comparative analyses will follow. July 17: Senator Beck Basin data presented at the international Global Fair and Workshop on Mountain Observatories, Reno, NV: on behalf of the authors of our recent Water Resources Research article, co-author Dr. Mark Raleigh, from NCAR, presented the 7-year Senator Beck Basin dataset to the “Observing the Mountain Water Cycle” session on July 17, 2014. Some 180 mountain scientists, from several continents, attended the conference. Mark’s talk was titled: “High elevation headwaters hydrology and snow monitoring at Senator Beck Basin, San Juan Mountains, Colorado, USA: a 7 year dataset“. 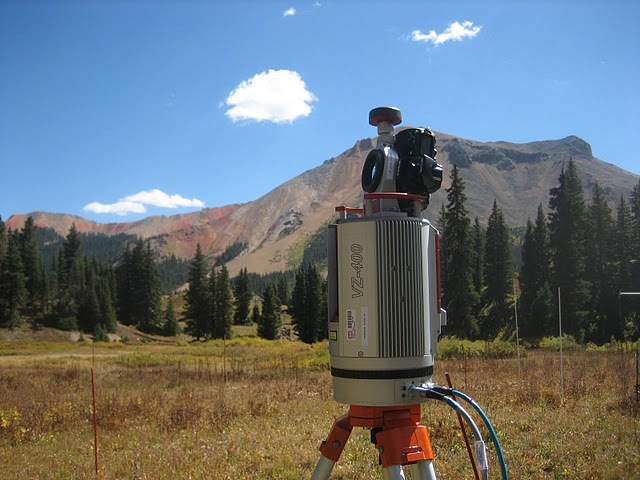 April 15-17: At the Western Snow Conference in Durango, Chris Landry presented “Dust on Snow Impacts on Colorado Hydrographs” and hosted a field tour to Molas Pass and the CSAS office in Silverton. March 11, 2014: We’ve issued a Press Release (pdf) about our recent Mountain System Monitoring publication in Water Resources Research. 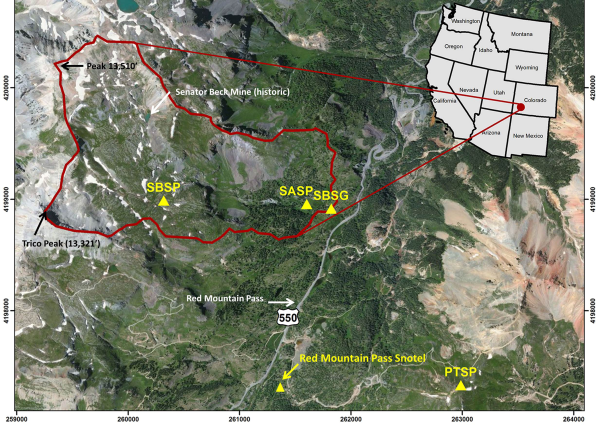 February 26, 2014: We are excited to have just published our Senator Beck Basin at Red Mountain Pass data in Water Resources Research! Our SUPER ESSENTIAL co-authors were Martyn Clark and Mark Raleigh of National Center for Atmospheric Research. February 20, 2014: Storm #14 for the season was a short and windy storm in which the barometer dropped an impressive .18 inches (from 29.98 to 29.80 in Hg) in just 8 hours. February 12-14, 2014: Field School for Avalanche Professionals held at CSAS Approaching the Swamp Angel Study Plot in Senator Beck Basin for a field session on snowpack energy budget measurements, at Red Mountain Pass. Photo by Matt Hoobler, from Wyoming State Engineer’s Office. November 24, 2013: Winter Storm #4 has wrapped up with no recorded precip for 12 consecutive hours. The National Weather Service is calling for an additional snow accumulation possible this afternoon and overnight. If we get another 1/2″ of SWE (12mm), we will count that as winter storm #5. 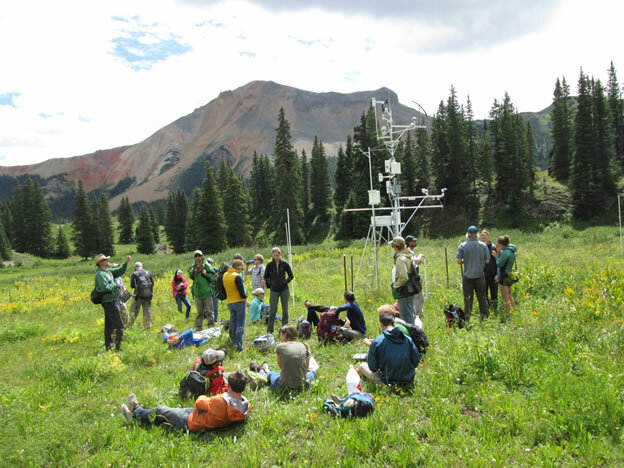 November 21, 2013: After the positive response to the ‘snow school’ session at last summer’s Colorado Water Congress in Steamboat Springs, CSAS is offering a 2 1/2 day Snow Field School in Silverton on February 12-14, 2013. This small workshop will be limited to ten students and is intended for water professionals. November 18, 2013: We now have 200 entries into our drawing (our max). Thank you to all who donated towards this successful fundraiser! The Silverton Standard will do the actual drawing and will announce the winner no later than December 1st! November 6, 2013: Chris Landry presented “Dust-on-Snow: Adapting to the New Normal” at the Upper Colorado River Basin Water Conference, Colorado Mesa University. October 2013: A new paper uses Senator Beck Basin data to explore how downward surface radiation is affected by cloud changes. Naud et al. (2013), Sensitivity of downward longwave surface radiation to moisture and cloud changes in a high-elevation region, J. Geophys. Res. Atmos., 118,10,072–10,081, doi:10.1002/jgrd.50644. October 4, 2013: Summer data and complete 2013 Water Year graphs are now available. September 23, 2013: First snow on the ground in Silverton (earlier in the morning), and 7 inches (.18m) of snow on the ground at Swamp Angel Study Plot. September 20-21, 2013: David Scott, a CSU PhD student, conducts a forest health study, coring Spruce trees in Senator Beck Basin. August 26, 2013: Ethan Gutmann from the National Center for Atmospheric Research Hydrometeorological Applications Program, and Warren Young, USFS soil scientist, visit Senator Beck Basin to do soil sampling for hydrologic properties testing. August 10, 2013: First dusting of snow on peaks surrounding Silverton. July 12, 2013: Several presentations at the Davos Atmosphere and Cryosphere Assembly (DACA-13, July 8-12) utilized data from or fieldwork at Senator Beck Study Area. In the Abstract Proceedings, see Deems et al. (page 10), Raleigh et al. (page 322), and Painter et al. (page 326). May 15, 2013: Snowmelt has really accelerated over the past couple of days. 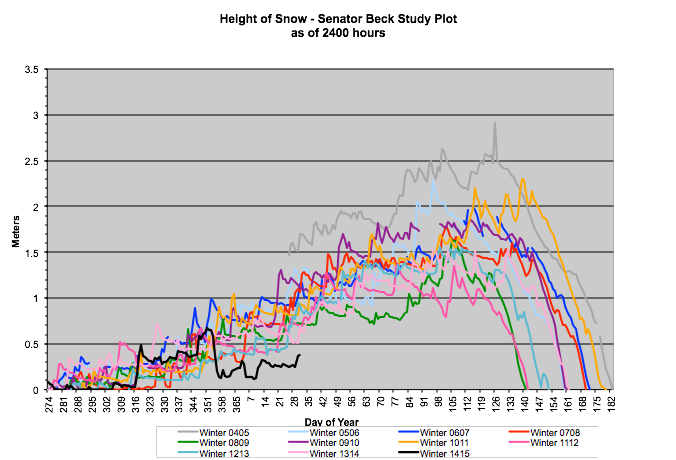 We’re updating graphs for Senator Beck Basin snowpack, precipitation and streamflow daily through SAG (Snow All Gone). April 19, 2013: Denver Post article today: Good news of deep snow in Colorado foiled by dust that will speed melt by Jason Blevins. April 18, 2013: Storm #21 and the long D8 dust event finally over. April 9, 2013: The 6th dust-on-snow event of the season blew in yesterday with a lot more dust than we’ve seen so far this season. The dust came with the beginning of Storm #19. April 3, 2013: First return to Senator Beck Study Plot in two months due to avalanche conditions. Today was very safe with new snow over solid, re-frozen crust. SBSP tower registering light, confused wind (upper wind monitor pointing south; lower pointing north). 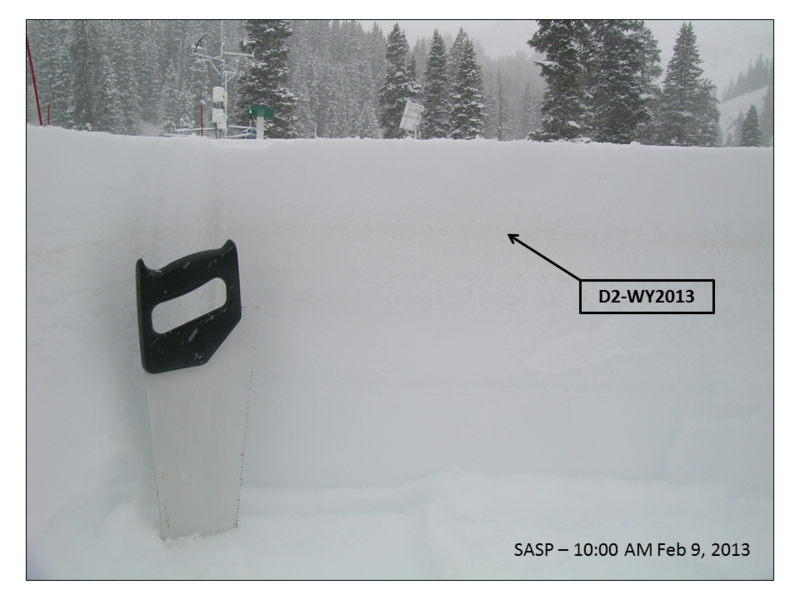 March 21, 2013: Wrap up of Dust-on-Snow Events (#4 and #5) and our 18th Winter Storm for the season. March 12, 2013: Our Basin stream gauge has been dug out and is back online for the season. March 7, 2013: We’ve posted images of our hand-drawn strip charts from the past couple of water years. We find these an invaluable visual tool for comparing seasons. March 5, 2013: Landry got some nice shots from Swamp Angel Study Plot of the sun coming up and some tracks with feather prints. The bird was probably a ptarmigan given the track size, wing span, and willow browsing behavior. March 4, 2013: We received almost an inch of water with Storm #16. Feb 27, 2013: Storms 14 and 15 have come and gone, leaving “severe clear” skies in their wake. Feb 9, 2013: Dust came with the evening and overnight portion Storm #13. This is our 2nd dust layer for the season. Jan 31, 2013: Yet another storm (#12) brought us more water (14mm) and snow (7.5″). Despite these 3 storms in a row, we are 2″ of SWE behind for the season compared to this time last year. Jan 30, 2013: Storm #11 started the evening of Jan 27th with colder temps and at least another foot of snow for us to shovel in Silverton. The storm effectively ended the morning of Jan 29th (Tues), with lingering intermittent very light snowfall continuing possibly into morning of Jan 31st (Thurs). Jan 27, 2013: It looks like our Storm #10 may have ended, with new snow containing a much needed 31mm (1.2″) of water at Swamp Angel Study Plot. to Silverton for the week. Chris Landry gave several lectures and led them on a trip to Swamp Angel Study Plot. Jan 12, 2013: Finally a storm to talk about! Storm #9 brought a record wind gust to SBSP (88mph) and snow depth at Swamp Angel reached more than 1 meter for the first time this season (at least for now). Dec 31, 2012: We’ve added graphs for visual comparison of precip and snowpack between years. 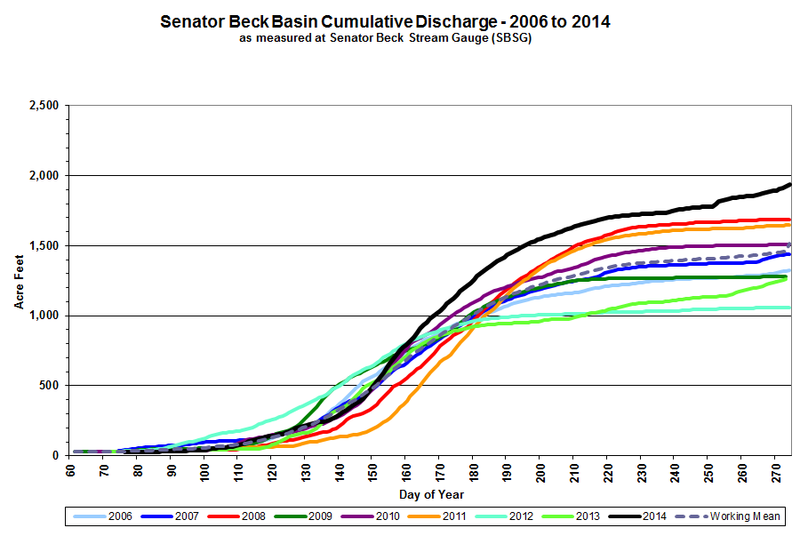 We’ve also updated several of our other Senator Beck Basin data graphs. Happy New Year! Dec 25, 2012: The nicely timed low intensity Christmas Eve storm (#7) came through leaving a “severe clear” Christmas day in its wake. We await more snow tomorrow. yesterday and perhaps again today. Hence, our incoming solar radiation measurements represent the maximum possible on these shortest days of the year. Put your sunscreen on! Dec 11, 2012: Winter Storm #3 brought another 14mm of water and a 14cm maximum increase in height of snow at Swamp Angel. Dec 9, 2012: Winter Storm #2 of the season came a full month after our 1st winter storm. This one yielded just 12mm of water at Swamp Angel, our threshold for calling it a “storm”. Nov 20, 2012: We have a lot to be thankful for this year! Check out our Annual Letter to Friends of CSAS. Nov 10, 2012: We’ve logged our 1st winter storm of the season and the 1st dust event of the Water Year. Nov 8, 2012: Chris Landry presented “Snow system interannual variability case study – WY 2011 and WY 2012” at the Upper Colorado River Basin Conference in Grand Junction. Nov 7, 2012: We’ve updated datasets from each of our 4 study plots, and made complete period-of-record .csv files available. Oct 25, 2012: Chris Landry writes about CSAS’ Ten Years in Silverton in the Silverton Standard. Oct 15, 2012: Summer 2012 data and new metadata documents covering our entire period of record are now available. Sept 13, 2012: We recorded the season’s first temps below freezing in Senator Beck Basin and attended the Colorado River District’s 75th Anniversary Annual Water Seminar in Grand Junction. July 23, 2012: US Forest Service approves funding agreement for $10,000 to support our Mountain System Monitoring program. July 16-20, 2012: Attending the CUHASI meeting in Boulder (with a poster) followed by the Colorado Water Workshop in Gunnison. See you there? July 1, 2012: A new dryest month record for the CSAS period of record with only 7mm of rain. June 2012 was more than twice as dry as any previous June in our period of record, and 1mm of water drier than last month. June 28, 2012: Three days in a row of rain! Unrelated to the weather, the phone line to our base station is down and won’t be repaired until at least Tues July 3rd. Our current conditions data won’t be updated until after the repair (July 3rd). 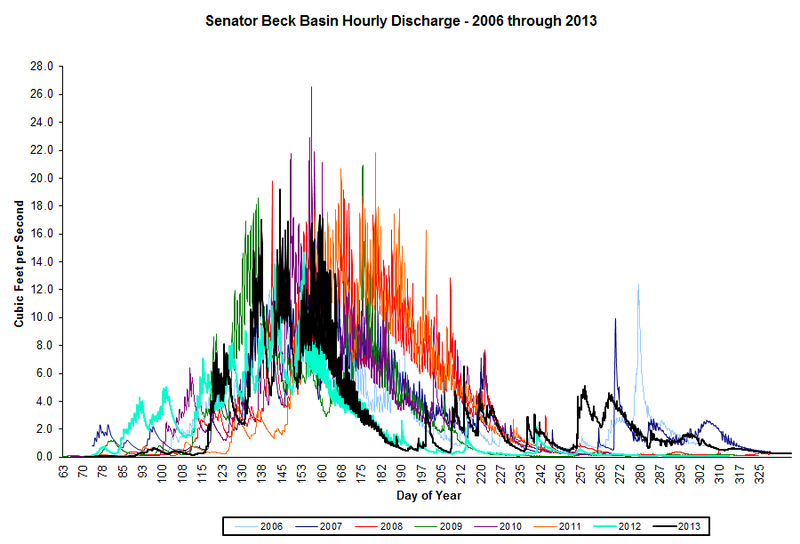 June 21, 2012: The 2011-2012 Senator Beck Basin winter datasets are now available for download. These newly posted datasets span October 1, 2011 through June 19, 2012. We are available to assist in working with the data. June 14, 2012: CSAS Board approves the Fiscal Year 2012-2013 budget with a strong outlook for this year, recognizing that our success depends on expanding stakeholder support. June 13, 2012: A two-part paper from our Senator Beck Basin Study Area is in press in Water Resources Research. June 1, 2012: May was the driest month we’ve ever recorded in Senator Beck Basin (since fall 2003). We recorded only 8mm of water compared to 190mm of water in May 2011! The previous driest months were June 2007 and June 2008 at 16mm of water. See our graphed data page for more stats and graphs. May 26, 2012: Dust engulfed Silverton in the strongest (daylight) dust storm of this season. May 23, 2012: The remaining alpine snow in the San Juans experienced the 10th dust-on-snow event of the season. Given the National Weather Service forecast, we expect additional dust events through Saturday. May 21, 2012: The last snow has disappeared under the sonar at Senator Beck Study Plot at 1800 hours today. There is still alpine snow in the vicinity, especially on northerly aspects. May 18, 2012: A mixture of wildfire smoke from Arizona and desert dust brought the 9th dust-on-snow event of the season to our remaining alpine snow cover. Visibility was only moderately reduced but this smoke/dust event ran from late morning through the evening. May 17, 2012: Colorado Water Conservation Board approves $50,000 towards our campaign to sustain Senator Beck Basin and our Colorado Dust-on-Snow (CODOS) program! 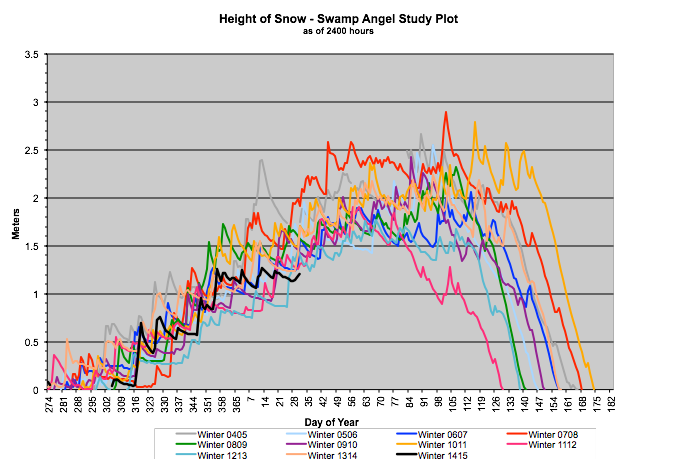 May 11, 2012: Today our Swamp Angel Study Plot reached Snow All Gone (SAG) at the earliest date we’ve recorded (since 2004). May 10, 2012: We’ve added a series of graphs plotting various soil data against snowpack. They are also an interesting way to compare snowpack across years and study sites. May 3, 2012: We are on the final leg of what is likely to be our final Colorado Dust-on-Snow trip for the season, traveling a mountain loop from Silverton to Steamboat Springs to Fairplay and back. April 28, 2012: A couple more storms have come in, though the total water for the year is still the lowest in CSAS’ nine-year history. April 16, 2012: Our first storm in a month (#21 for the season) brought much needed 1.2″ of water and over a foot of non-dusty snow. April 8, 2012: We’ve now experienced 8 dust events for Water Year 2012 and our stream gauge has already reached 4 cfs (earliest in our period of record). Many say we haven’t seen a winter as dry as this one since 2002, but alas our data collection didn’t begin until 2003. March 20, 2012: After two weeks of sunshine, this season’s 5th dust event came in with the 20th storm of the season just as we returned from a 1,300 mile tour CODOS of Colorado’s snowpack. March 13, 2012: Landry attended the Canyon Country Science Symposium in Moab, UT. March 6, 2012: Researchers from the Army’s Cold Regions Research Lab, Boise State and Western Water Assessment have arrived to conduct a field campaign in CSAS’ Senator Beck Basin Study Area. March 5, 2012: Just Published: Climate Researchers Catherine Naud (Columbia Univ.) and James Miller (Rutgers Univ.) utilized data from our our well-instrumented ground-based site [Senator Beck Basin] in their paper: Naud, C. M., J. R. Miller, and C. Landry (2012), Using satellites to investigate the sensitivity of longwave downward radiation to water vapor at high elevations, J. Geophys. Res., 117, D05101, doi:10.1029/2011JD016917. Feb 16, 2012: Climate Researchers Catherine Naud (Columbia Univ.) and James Miller (Rutgers Univ.) utilized data from our our well-instrumented ground-based site [Senator Beck Basin] in their paper: Using satellites to investigate the sensitivity of longwave downward radiation to water vapor at high elevations, J. Geophys. Res., doi:10.1029/2011JD016917, in press. Feb 13, 2012: Our snowpack is on the rise with Storm #16 for the season. Feb 10, 2012: Chris Landry is just back from the USGS Colorado River Water Science Stakeholders’ Roundtable in Salt Lake City. Jan 17, 2012: Finally another winter storm! 12″ at Swamp Angel. Wind blew off most from Senator Beck. Dec 31, 2011: Year ended with a gust of 94mph recorded at our Putney ridge top site. Strongest gust since Feb 19, 2011. With that wind, we also received our 3rd dust event of the season. Dec 11, 2011: CSAS and Chris Landry in a New York Times article on air quality. Nov 30, 2011: Check out 2 new blog posts with info from CSAS: Cool Climate Collaboration from the Colorado Natural Heritage Program and Never Stop Exploring from The North Face and Protect Our Winters. Nov 26, 2011: The datalogger at Swamp Angel Study Plot freaked out early Thanksgiving morning, just before winter storm #8. We replaced it and got everything working again on Nov 26th (DOY 330). Nov 18, 2011: Our annual fundraising letter is in the mail. The beginning of winter is our meager budget’s leanest time of the year. We appreciate those of you who are makings donations and holiday shopping with our “Shop for CSAS” campaign! Nov 13, 2011: Storm #6 was the 12-12-12 storm that started and ended on the 13th. Oct 27, 2011: We’ve posted summary graphs to give you a snapshot of 7 years of CSAS data. Oct 27, 2011: Check out the data from our 3rd Winter Storm of the season. Oct 4-6, 2011: We experienced a wet and windy 1st winter storm of the season. See our Storm Report for the details. October 5, 2011: We’ve posted our Summer 2011 data and metadata. The past 12 months turned out to be our biggest water year yet with 55″ of water! October 2011: Patagonia used a photo of one of our dust-on-snow “gravimetric” pits for their “Seeing Red” essay in the latest catalog! Sept 27, 2011: Our phone line has been repaired and current conditions are now posted. Contact us if you need data from the past week. All data will be posted at the end of the season. Sept 21, 2011: our field station phone line has been down since noon Sept 21st. We’re still waiting for it to be repaired. Meanwhile data is continuing to be collected as usual and will be posted as soon as the phone line is working again. Sept 9, 2011: Fall is underway! The towers at our Senator Beck Basin, Swamp Angel and Putney Study Plots are ready for the snow to fly. On Sept. 9th our upper elevation study plots experienced below freezing temps for the first time since June. 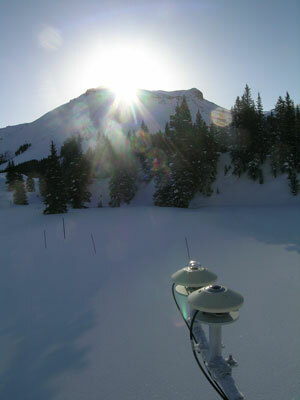 June 2011: We’ve added a new section with a lot of information about our Colorado Dust on Snow (CODOS) program. Check it out! June 2011: Winter 2010-2011 data are now available to download from our archival data page. May 2011: We’ve updated our website menu. Current Conditions are now found under the Dataheading. You may need to update your bookmarks to hourly/24hr study plot pages. March 14, 2011: We’ve updated our website menu. Current Conditions are now found under the Data heading. 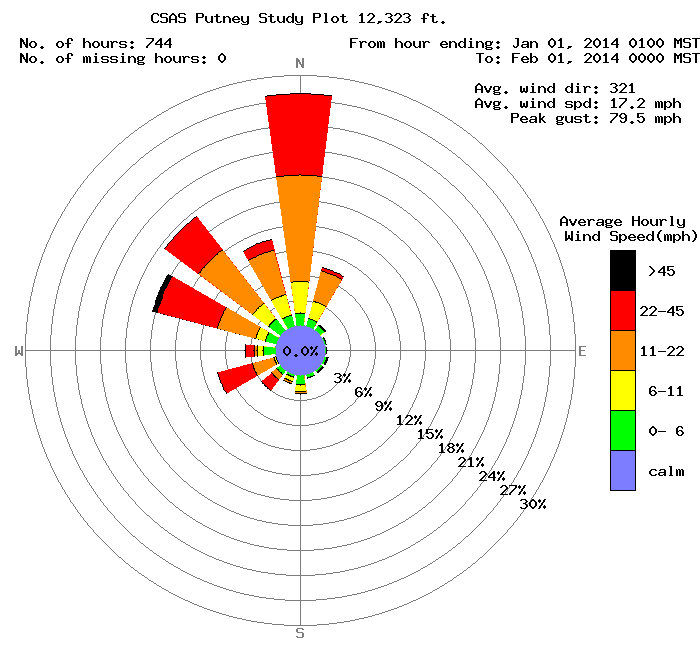 You may need to update your bookmarks to hourly/24hr study plot data pages. March 2011: Half dozen graduate students from Boise State study the snowpack in Senator Beck Basin with Hans-Peter Marshall. Feb 2011: CSAS hosts college courses from three Universities in early 2011. Dec 2010: Several posters and talks at the December 2010 American Geophysical Union (AGU) feature research supported by CSAS. Check them out! National Science Foundation praises CSAS Research!